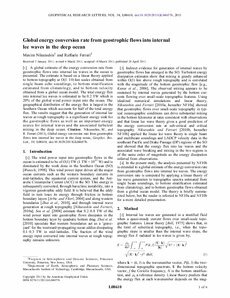 A global estimate of the energy conversion rate from geostrophic flows into internal lee waves in the ocean is presented. The estimate is based on a linear theory applied to bottom topography at O(1每10) km scales obtained from single beam echo soundings, to bottom stratification estimated from climatology, and to bottom velocity obtained from a global ocean model. The total energy flux into internal lee waves is estimated to be 0.2 TW which is 20% of the global wind power input into the ocean. The geographical distribution of the energy flux is largest in the Southern Ocean which accounts for half of the total energy flux. The results suggest that the generation of internal lee waves at rough topography is a significant energy sink for the geostrophic flows as well as an important energy source for internal waves and the associated turbulent mixing in the deep ocean.